For the next couple of months, I'll be sharing the progress on the production of the upcoming MANGA MUERTO VOL. 1 comic book. 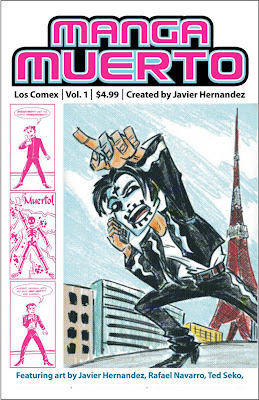 Check out the previous post for the history of this Japanese influenced offshoot of my comic book character, El Muerto. The first of the four guest pin-ups for the new book is in! This was sent to me recently by Krishna Sadasivam, a cartoonist who's been publishing online for over 10 years. Krishna's main strip, PC WEENIES, is updated three times a week. His latest strip, UNCUBED, is a comic about 'an Indian guy named Krishna'. It's my favorite autobiographic comic of recent memory. Krishna is now taking pre-orders for his first-ever collection of PC WEENIES strips. Check his site for ordering info and support a great artist. Krishna has another website where you can commission him to draw a customized robot. I thought he'd be a perfect artist to ask to contribute a Manga Muerto pin-up and was delighted when he agreed to do one. Krishna had previously sent me a drawing he had done of El Muerto. So now he's a two-time Muerto contributor. First thing I did when I opened his file in Photoshop was laugh with delight at that great look on Muerto's face. He's so smug showing off his robot! I've got three other mystery artist's line up, but I'm waiting to receive those. This will truly be an ocean-spanning effort, as far as some of the artist's are concerned. Another bit of behind-the-scenes process I can share with you comes via a podcast I recently did on THE IDIOT ENGINE, hosted by fellow cartoonist (and Manga Muerto collaborator) TED SEKO. Ted had me on his most recent episode where we talked about going back and revisiting old material. In my case I talked about taking the earliest Manga Muerto story and doing some re-lettering on the dialogue. 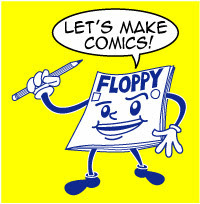 Check out the episode as Ted and I discuss how we handle re-publishing our older comics. Click here to hear the podcast (it's Episode 10). A word to those with limited time: The first 35 minutes we discuss Ted's 'warm-up' topic, so if you want to jump right into the main topic just scroll your iTunes marker to the 35 minute point. (Just subscribe via iTunes first). 8 months ago I opened up a Deviant Art page. My friend Jason Martin, who I met a few years ago at San Diego Comic Con as we sat side by side in Arist's Alley, recommended I get a page. He often spoke of the benefits of both having a forum for sharing your artwork and also being exposed to a whole world of art. So, I opened one.....and never went back to update it! A few weekends ago I decided to go back to my Deviant Art page and finally update it with some pics of MAN-SWAMP and MANGA MUERTO, two projects which will be released as comic books in the next months. C'mon, I never let an opportunity to promote my work pass me by! And last week I was checking out the other artwork on Deviant Art, looking for people's takes on such characters as Devilman, Mr. A, etc. etc. 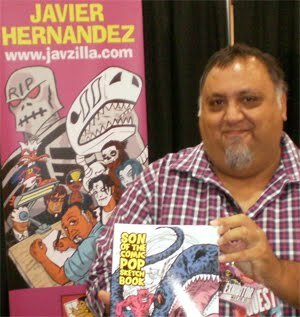 Well, on a whim I decided to enter 'El Muerto Javier Hernandez, just to see if anyone had done some art I hadn't seen before. Well, I found several pieces, most of them were pinups friends of mine had done before. 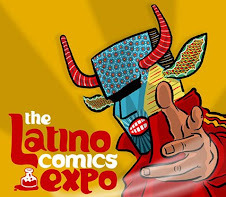 And it's cool that they post it on their various sites, I mean, it's more exposure for El Muerto, right? Well, there were a couple of pieces I had never seen before, and boy was I surprised and delighted to find them! The artist's Deviant Art name is *BeatingDeadHeroes*, and her piece really struck me. 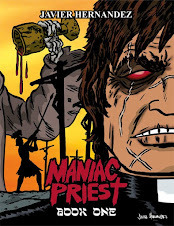 For one, just to see a piece of EL Muerto art that someone created is always an honor. But also because of the fact that it's such a beautiful piece! 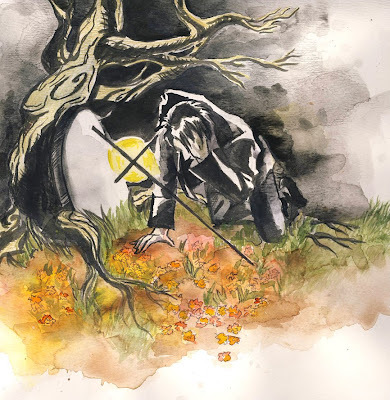 It looks like the sort of watercolor piece you'd see in an illustrated storybook of EL Muerto. *BeatingDeadHeroes* did two pieces, so check out her Gallery to see the other one, as well as all her other work. She actually works in a wide variety of mediums: Illustration, photography, Paint, Printmaking etc. Her comments about her thoughts behind each piece are insightful, and really makes the whole Deviant Art process appealing. She mentioned that she had actually seen the Muerto movie on cable, and was inspired to create these pieces. I always figured that once the film was out, and as time went on, people would discover it on their own. This is one of those instances where the film moved someone to create some artwork. That's the truly great thing about getting a movie made out of your comic. More people are apt to see the film, way more people, than would ever come across your independent comic book. And film or comic, it's still your character, your idea, that they see. Me and *BeatingDeadHeroess* now have a swap in progress: I get to have the original watercolor, and she'll be receiving some Muerto comics! 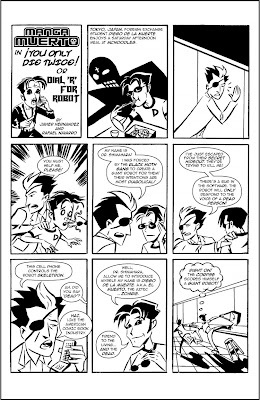 To check out some of the other El Muerto guest artwork, check out my Favorites Gallery here. And if you have your own Deviant Art page, let's be friends! Read the original Manga Muerto comic online!! Well folks, I finally did it! Javier Hernandez lands right smack dab in the middle of the 21st Century! I have, at long last, posted one of my comics online! 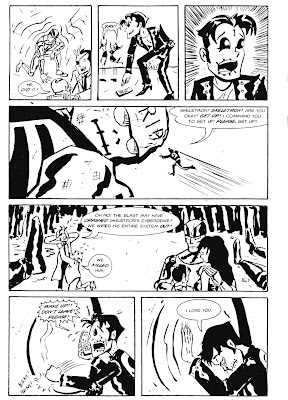 This is actually the first Manga Muerto comic, from the pages of my old newsletter, THE BORDER! See kids, before Twitter and Myspace and iPods, people used to print...ah, nevermind!! The story, "YOU ONLY DIE TWICE" or "DIAL R FOR ROBOT!" was written by me, and I also pencilled the story. However, my old pal and comic book compadre Rafael Navarro (of the award winning SONAMBULO comic) provided the finished art and his trademark dazzling inking chops. Me and Raf are both huge fans of GIGANTOR and GIANT ROBOT so it was natural that we team-up for this historic first Manga Muerto story. Basically I've just re-lettered the entire story, as the first time I don't thing stood the test of time in terms of quality or readability. But don't worry everyone, I didn't change any of the actual story! No "Skullion shot first!" controversies will take me down (George Lucas, anyone?). Like the song says, "I'll be there...". 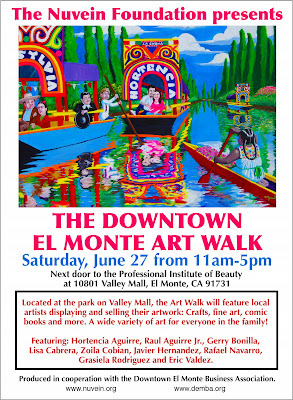 Please come on out and visit us! I started tinkering around with some cover designs for my next book. MAN-SWAMP is currently at the printers, and as soon as I receive my proof, if all is well, I can place an order for the first run. The drawing was actually done in crayon, which is something I've wanted to try for awhile. The textures you get from crayons was what I was most interested in. I liked using them, but I think when I redraw the image, I may ask a friend of mine to watercolor it. The softness of crayons doesn't let me get the fine points out of them that I'd like to. But I like the pose of the character. I just need to draw his flying robot in the sky above, and tinker a bit with some compositional elements. Flying robot? Yeah, you didn't know? 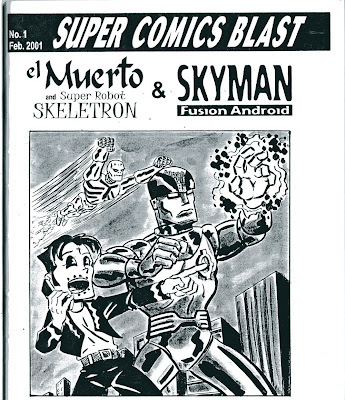 Manga Muerto has a giant flying robot called SKELETRON! 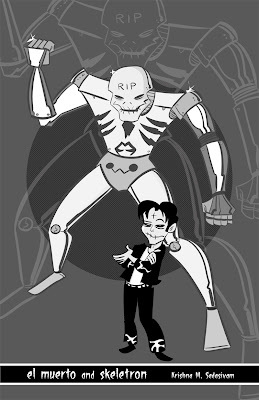 In the debut Manga Muerto story, I introduced Skeletron along with this version of El Muerto. The whole reason of doing this story was my desire to create my own giant Japanese robot comic, so I figured I'd just turn Muerto into a Japanese-esque character, in the honorable tradition of childhood favorites like GIGANTOR and JOHNNY SOKKO AND HIS FLYING ROBOT. Marvel had licensed SPIDER-MAN to Japan in 1970 for a manga and later, a live-action TV show. And DC had authorized BATMAN to appear in manga in the 1960s. Figured I'd do it myself, as I was a fan of Japanese comic and cartoon heroes anyways. This was a four page story that I premiered in my old newsletter, THE BORDER. (It was reprinted in EL MUERTO MISH MASH). On that first story, my good friend and fellow DIY comics creator Rafael Navarro (of Xeric Award winning SONAMBULO fame) collaborated with me. I wrote the story and did pencil layouts, and Rafael finished the art and beautified it with his stellar ink work. He sure did a fabulous job, don't ya think? 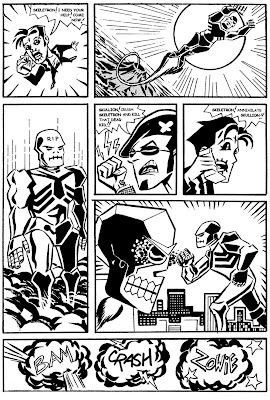 The second appearance of Manga Muerto was in 2001, in a photocopied squarebound comic called SUPER COMICS BLAST. For this story, I teamed up with another friend and comic creator, Ted Seko. We decided to do a team-up story where he brought in his character, Skyman (who late was renamed Fusion Man) and supporting cast, and collaborated with me on a story involving Monster Mechs and two groups of intergalactic gangs of evildoers! Ted and I hammered out the story, I did the pencil layouts and took lead on the dialogue, while Ted did the finishes on the art and inked in his trademark style. That was a really fun time, as we both have very similar interests in some of the classic Japanese shows. Here's the cover to the long out-of-print SUPER COMICS BLAST! Ted inked the drawing and also provided an ink wash, I handled the penciling. Ted's SKYMAN is the robot on the right. In the background is SKELETRON, whom Muerto controls via cell phone! About the MANGA MUERTO VOL. 1 comic: It'll reprint the first two stories mentioned above, as well as featuring a brand new short story I'll be working on all by little lonesome. I've got four cartoonist in mind to ask for pin-ups (the eagle-eyed among you will have noticed that I've blocked the names out on the cover until I actually approach the people!). I threw a halftone filter over the artwork, just to see how it would look. Like I mentioned, I'm going to try to get the drawing watercolored. The logo may get some tinkering, but I like the color schemes. It seems to have a real playful, manga pop art look that I think fits these stories well. Not exactly sure of the page count, so the price point may change. But I like to mock up these covers and look them over for awhile. Often I can either get sick of them right away or see little things that need tinkering to make them better. This one I'm really digging. 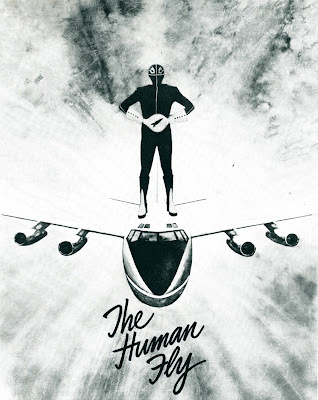 Readers of this blog will have no doubt heard me blather on about THE HUMAN FLY, the 1970s Marvel Comic written by Bill Mantlo based on a real-life costumed stuntman. Well, the other day I was going through one of those intimidating piles of books/comics/papers/drawings I have laying about the studio space here, and lo and behold I found this missing photograph! Yes, my friends, an actual Honest-to-Evel Knievel HUMAN FLY publicity photograph! By a billion-to-one chance, a few years ago I saw this on Ebay. I was, thankfully, the only Bidder and got it for probably less than $10-$15, if memory serves me. Outside of the 19 issue Marvel Comics run, I know of no other licensed FLY memorabilia. (Man, how I wish a secret stash of an unreleased HUMAN FLY Mego action figures would show up out of nowhere!). The photo isn't hand-signed, but what a cool looking pic. Totally cheesy, yet badass in it's own way! Anyone knows of any other FLY stuff floating out there, lemme know!